If you’re looking for somewhere to go plane spotting, you might think of busy international airports like Heathrow or Gatwick. While you’re obviously going to spot many planes at large airports like these, there are plenty of other top places for plane spotting throughout the country that you might have overlooked. CountryCottagesOnline.Net also features some cottages with exciting opportunities for plane spotting on holiday. Head to the beautiful coastal town of Bournemouth at the end of August to see the Bournemouth Air Festival. It’s now in its 10th year and runs across four days, from 31st August to 3rd September and is held across the seafront. This free airshow has all sorts wonderful aerial displays, with aircraft from the Royal Navy and Royal Air Force, as well as civilian aircraft, featuring in the line-up. The event’s festivities even carry on into the night, with special dusk displays lighting up the night sky. Norwich Airport is one of the smaller international airports in the UK. It has quite a few regular scheduled flights around the UK and overseas, as well as seasonal charters. What makes this airport particularly good for airplane spotters is that there’s an on-site engineering base where you can see aircraft being worked on. Here you’ll also find the City of Norwich Aviation Museum where there are several dozen preserved aircraft on display, so whether you want to see air-borne planes or planes on the ground, there are plenty of options in Norwich. If you’re in Cambridgeshire, be sure to visit Duxford, as it’s home to the excellent Imperial War Museum Duxford. This museum is the UK’s largest aviation museum and is home to almost 200 aircraft houses in several permanent exhibits. Some of these include the American Air Museum, which features the largest collection of US aircraft outside of the US, and the Flying Hangar, where you can see various airplanes being restored and serviced. The museum also hosts several airshows throughout the year. 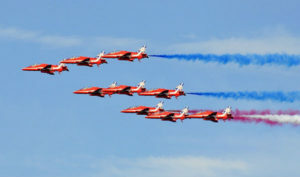 The city of Sunderland plays host to the annual Sunderland International Airshow, a three-day event that takes place towards the end of June. It’s great for avid plane spotters as not only is it one of the largest airshows in the UK, it’s also free. In fact, it’s the largest free airshow in all of Europe, attracting some two million spectators a year. The coastal event features a variety of civil and military aircraft and display teams – some of the event’s many highlights include the Battle of Britain Memorial Flight, the RAF Typhoon Display Team and the Red Arrows. For something a bit different, visit Kemble Cotswold Airport near the village of Kemble in rural Gloucestershire. The storage and scrapping airfield is regarded as the best place in the UK for seeing aircraft that are either being overhauled or retired altogether. You might be surprised to learn that it isn’t just UK planes that end up here – you’ll find planes from all over the world here. It’s definitely worth visiting as you might see something you won’t easily find elsewhere in the UK. There are ongoing rumours the airfield is to be turned into a housing estate, so be sure to visit it as soon as you can just in case. 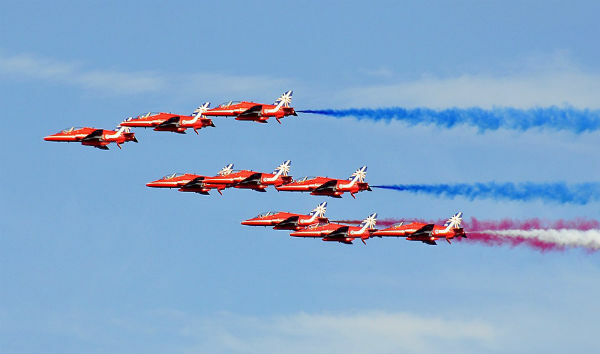 Also held in the gorgeous English Cotwolds each year is the Royal International Air Tattoo. This event is usually held in July and features an exciting range of planes and jets each year, including some impressive historical planes, as well as military aircraft, don’t forget your camera! Arriving early is recommended though as traffic jams getting to this event can be off putting. Even better would be staying in Fairford and walking to the event! These are just a few of some of the best UK locations for plane spotting. Remember though, to stay on public property and to cooperate with the local authorities. Be considerate of the airport, the local area and, of course, any fellow aviation enthusiasts you might see. Use your common sense, avoid getting into trouble, and most importantly of all, have lots of fun spotting planes.